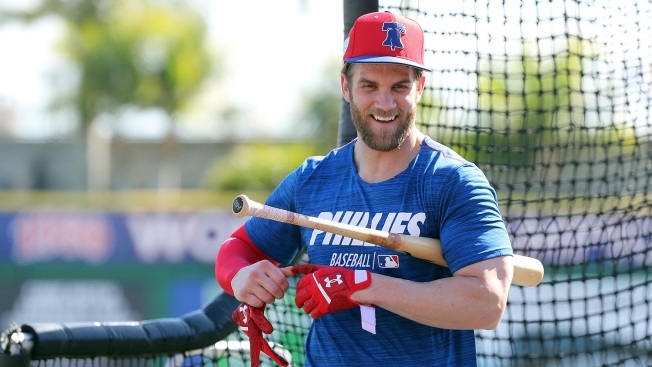 Bryce Harper hit so many perfect notes Saturday - before and after his introductory press conference - that will stick with Phillies fans. From hinting at Mike Trout to paying respect to Roy Halladay to citing his blue-collar upbringing to calling J.T. Realmuto his favorite player in baseball. Harper also described the type of parade he wants to be a part of - "I want to be on Broad Street on a friggin' boat or bus or whatever it is and hold a trophy over my head." That championship description involved a slip of the tongue. Harper accidentally referred to "D.C." rather than Philly. A decade ago it would've gone unnoticed and been quickly forgotten. But this is 2019, when every word uttered by an athlete or celebrity is subject to immediate dissection. It was an emotional day for the Harpers. He said a lot of words, answered a lot of questions. He actually didn't even realize he said D.C. until his wife later brought it up to him. "Uhhh, probably November," Harper said with a laugh Sunday when asked how long it will take for all of this to soak in. "I think it's going to take me some time, take my family some time. Of course, I made that comment yesterday about D.C., trying to bring back the title to D.C. and that's something that I tried to do for the last seven years. So it's going to be new, it's going to be different. "I'm a Philadelphia Phillie now and I'm excited to be part of it, get to know everybody, get to know the city. I like the blue a little bit, that royal blue [shirt] is pretty sweet, a little different color. But like I said, I'm excited to be part of it, get to know everybody and I'l let you know in November how I feel." There were plenty of jokes made - mostly by folks outside of Philly - about the D.C. slip-up. Including a pretty funny Instagram caption from Mets pitcher Noah Syndergaard. "I didn't really notice it until my wife told me after the thing," Harper said. "I was like, oh man. I didn't even notice it. Like I said, it's going to take some time, for sure, but that's part of it. When you grow up from 17 to 25 in an organization and you're trying to do everything you can to win for that organization and bring a title somewhere, you're going to have those slip-ups. That's part of it. But like I said, I'm a Phillie and I'm very excited about it." As are the 220,000-plus who have purchased tickets in the three days since the Phillies agreed to their 13-year deal with Harper. Using $30 as an average ticket price, then adding parking and concessions ... Harper has, in a way, already made the Phillies about $10 million back.